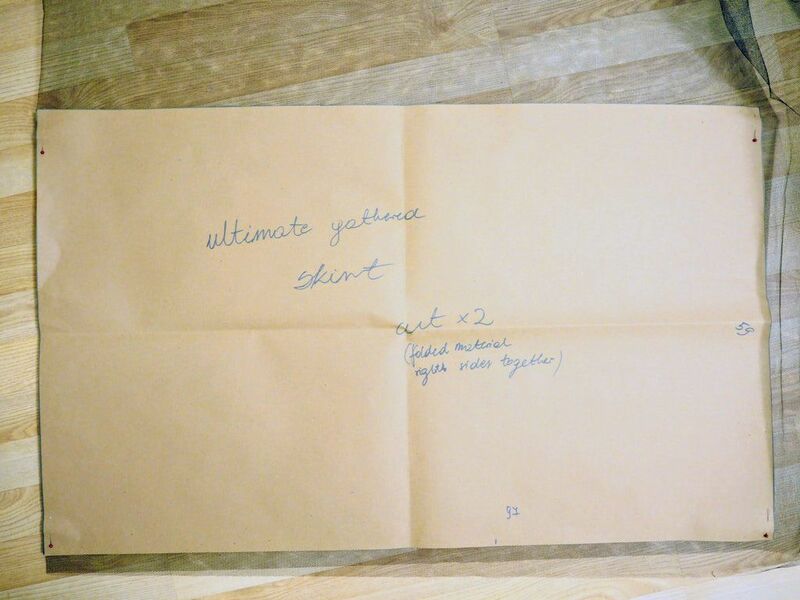 Are you in serious need of a petticoat and you need it for like… yesterday? This tutorial is all you could wish for from any project – it’s easy, it’s quick and it does the job! 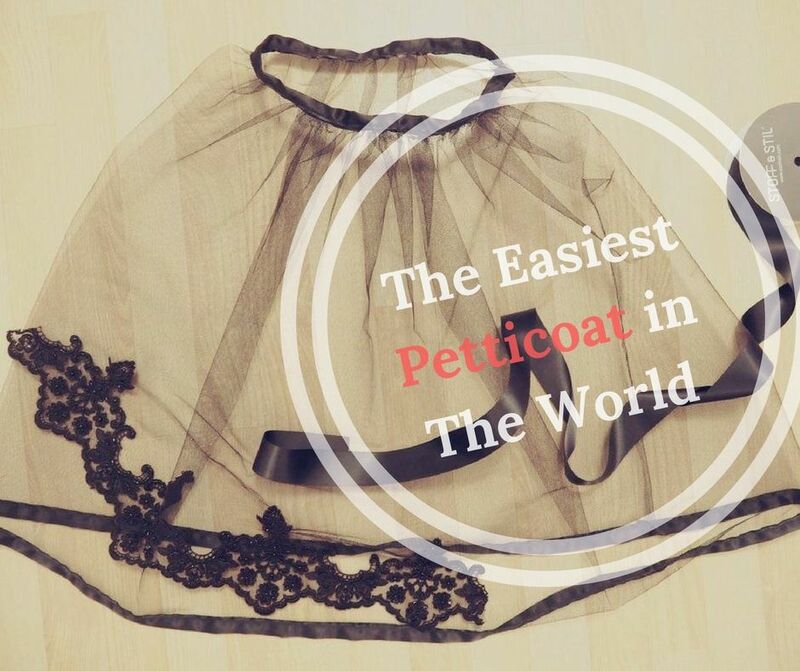 Keep reading to learn how to make the easiest petticoat in the world! If you have ever made a gathered skirt before, this tutorial will be easy peasy for you. I was planning to show you just how much puffiness you can achieve with this petticoat by taking a picture of me in a circle skirt (with and without petticoat). Unfortunately, I made it a while ago and before I got down to writing this tutorial, I became annoyed with my circle skirt, ripped it apart and made a smashing pencil skirt out of it. Good choice for my wardrobe, bad choice for the tutorial. I hope to make it up to you guys soon. I used a pattern that I had from before for making a simple gathered skirt. All you need to do is draft a simple rectangle and then cut two on fold. Measure your waistline. Then, divide that number by 2 and after, the number you receive must be multiplied by 3. It’s very simple. (you have front and back panels and each of them needs to be 3 times as wide as your measurement in order to achieve enough puffiness). You should have a simple rectangle. 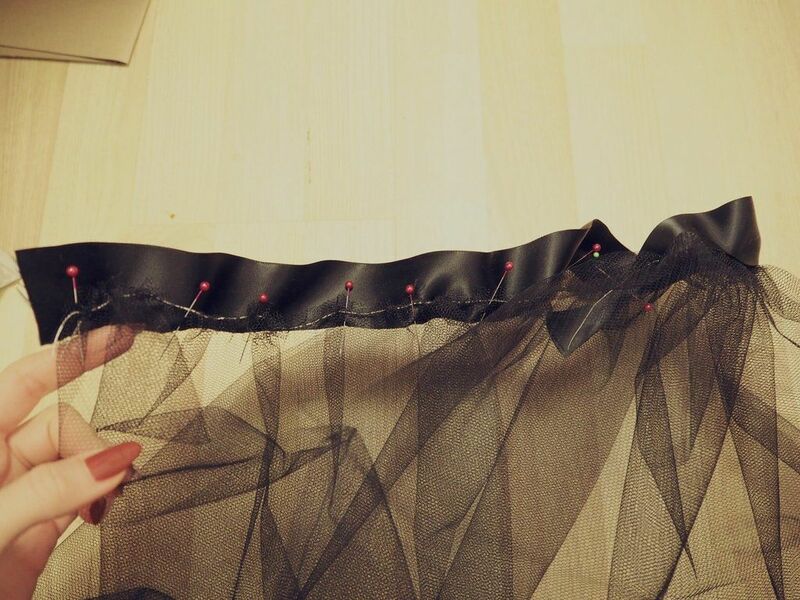 Fold your tulle over. Put the side of your rectangle against the fold of the fabric (lengthwise) and cut two rectangles (on fold). 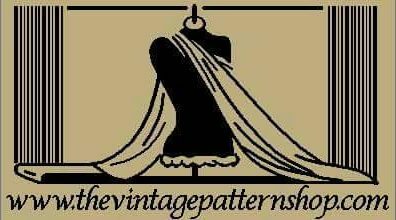 Once you cut out your pattern, you will have two rectangles. Put them right sides together and stitch from top to bottom on the right side. Then, mark a point around 15 cm from the top and stitch the side seam only to that point. Leaving this small opening will allow you to get in and out of your petticoat without a problem. The mesh I used was quite stiff so I didn’t have any problem with it creating a visible hole once I put it on. Get ready, this will be fun! I learned this gathering method from Gertie and I love it! 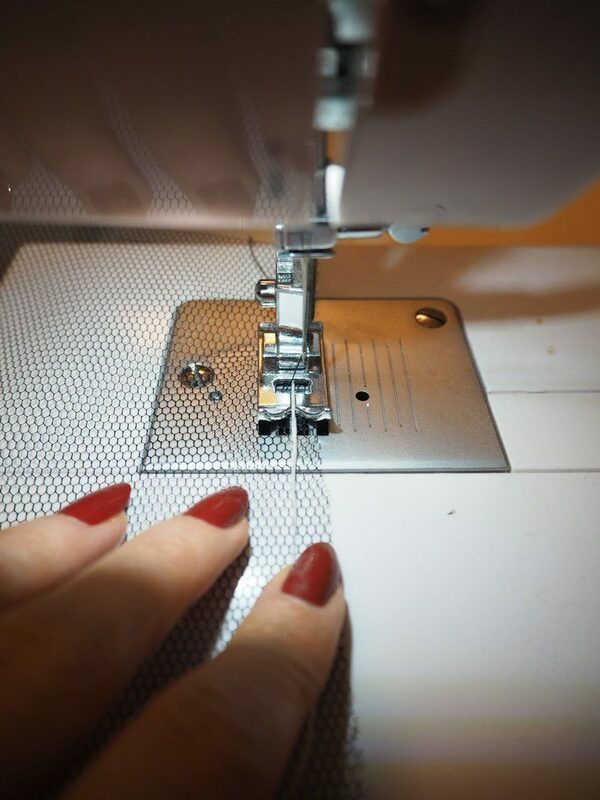 Grab the dental floss and put your sewing machine on a long, wide zigzag stitch. Put the dental floss in the middle of the foot, so that the zigzag stitch will enclose it on both sides. Stitch all the way across the upper edge of the rectangle. Do not backstitch in the beginning or at the end. Now you are ready to start gathering and as long as you didn’t stitch through your dental floss (like me…) it will be the easiest gathering you’ve ever done. Keep gathering till you reach the length of your waistline and tie the ends of your floss. Traditionally, you would distribute your gathers evenly across the whole skirt, but I’m cheeky and I concentrated most of my gathers and the back. Up to you! Cut out a strip of ribbon that is as long as your waistline plus 4 cm extra. Attach one end of the ribbon to the skirt, leaving extra 1 cm. Attach another end of the ribbon and leave extra 3 cm on the side. Start pinning the ribbon to the skirt and keep checking that the gathers are just where you want them to be. Once you are done pinning, sew the ribbon and the skirt together with a straight stitch. First, take the shorter end. Fold the ribbon right sides together, pin in place and sew the ends together, close to the edge of the skirt. Next, take the longer end of the ribbon. Fold it right sides together, pin in place and sew, leaving 2,5 cm of ribbon from the edge of the skirt. This will create an overlap. Cut the excess ribbon and flip it back to the right side. 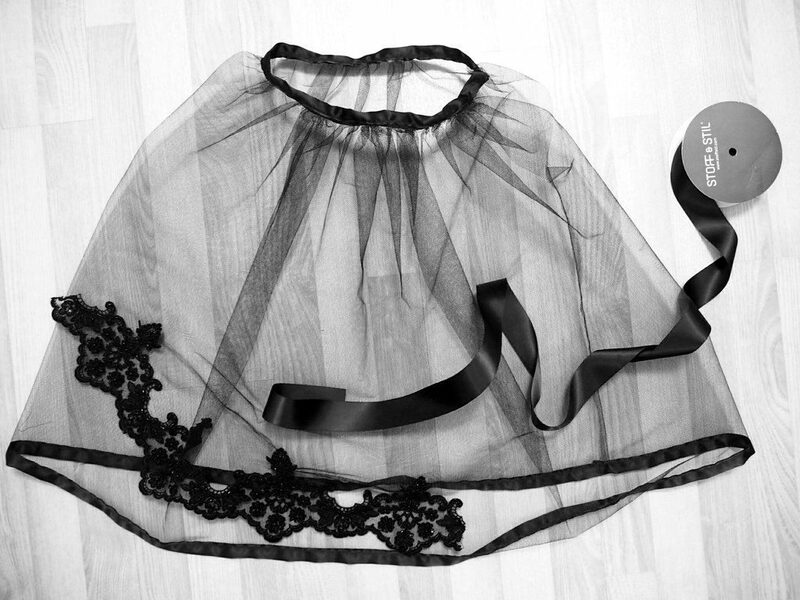 Now that you enclosed both ends, it should be easy for you to fold the ribbon in half, over the gathered tulle. Pin it in place and stitch the other side of the ribbon to the skirt. This way, your waistband is finished. This is probably my favorite step, but it is totally optional. 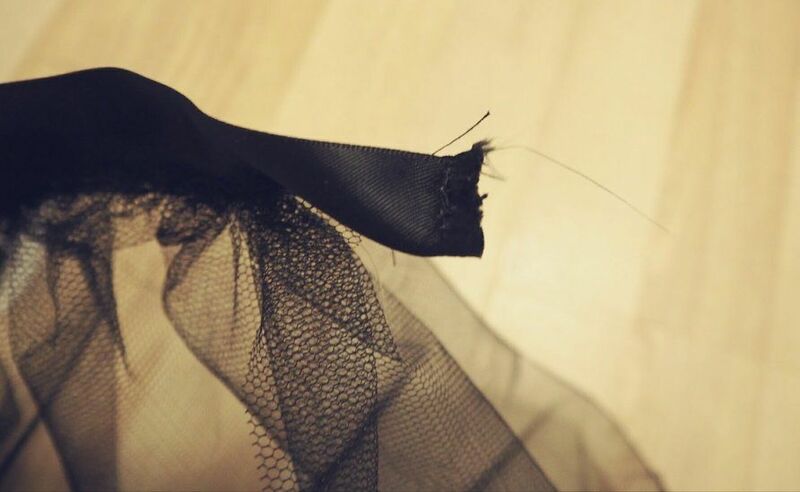 This type of tulle doesn’t unravel or any such thing, so you can just leave it as it is. However, I think it is a little itchy, so I decided to hem my petticoat with the same ribbon I used for the waistband. To do that, simply keep folding it in half over the edge of the skirt and pin it as you go. When you get to the beginning of the ribbon, take both ends, put them right sides together and stitch. This will help you achieve a very even edge without any unraveled ribbon. Now pin the ends in place on the skirt. Sew it with a straight to attach the ribbon to the skirt or use a decorative stitch to make things more interesting. Make this step fun by playing around with your hem. You might use a satin ribbon like I did or a beautiful velvet ribbon. You can choose to use a piece of lace on your hem or a pompom trim. All those options would look really fun and only your imagination is the limit. The only rule I would stick to here is to keep your petticoat monochromatic. If you used white tulle, use white lace for the hem. 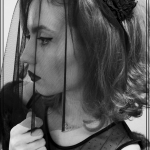 If you used black tulle, only add black elements. In order to close my petticoat, I used a small hook and eye. You might choose to use a button, for a more vintage look. Both options are just as functional. What do you think? Would you like to make a simple petticoat to compliment your arsenal of lovely skirts? There is no explanation for seams on this petticoat, so do you just sew part way up the back seam to leave an opening to get in and out of the petticoat? Thank you.